Abundant sunshine. High 91F. Winds WSW at 15 to 25 mph. Winds could occasionally gust over 40 mph.. The ore bins, head frame and powder house for Gould Mine are seen, from left to right, with two miners’ tents at bottom right. 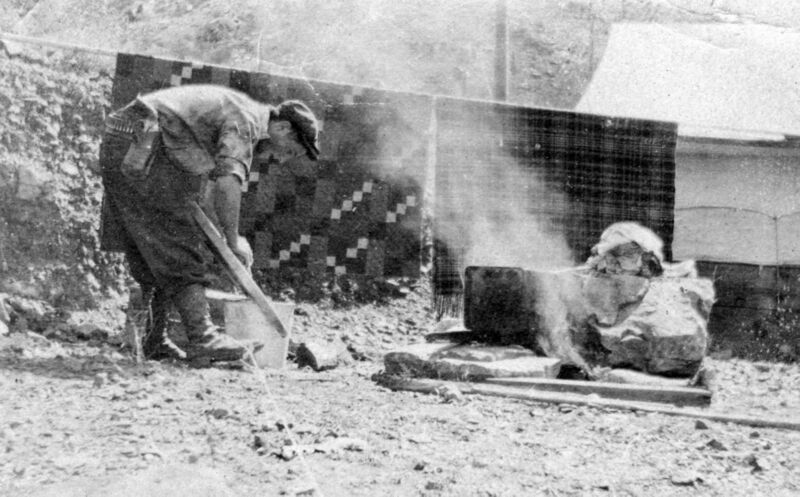 Mining engineer Walter Strange Pfrimmer works at a tent site near the Gould Mine in the Tucson Mountains in 1913. The Tucson Mountains contain many mines, some of which are evident along an extensive trail system. The Gould mining camp tailings seen from Kinney Road are accessible from both the Sendero Esperanza Trail also known in Spanish as the “trail of hope” and the King Canyon Trail. Miners who surveyed this area more than 100 years ago hoped to find precious metals. The Sendero Esperanza Trail accessed off Golden Gate Road connects with the Hugh Norris Trail on its 4-mile journey to Wasson Peak. Along the way hikers can view remains of the Gould Mine, consisting of a wooden head frame along with a grate that covers a shaft more than 300 feet deep. The Gould Mine was one of the more successful mines in the history of the Tucson Mountains, even though it failed to produce an abundance of mineral wealth. It is currently classified as a historic mine and is identified as an archaeological site by the National Register. Its origins date back to 1906 when S.H. Gould created his own mining company. The Gould Copper Mining Co. filed 19 claims in the Tucson Mountains between the years 1906 and 1911. It sensationalized its findings in stories that the Tucson Mountains contained a bonanza of copper. However, the history of the mining company proved that this was far from the truth. The company ended its speculative practices in 1911 after having only acquired 45,000 pounds of copper valued at $9,000. Several years later, the company went bankrupt because the costs of mining outweighed the compensation. Future mining enterprises attempted to improve this figure, but with no significant gains. The mine has not been active since its final closing in 1954. The Gould Mine played a role in heightening awareness among the public regarding the importance of land preservation in the Tucson Mountains. During the late 1950s, the Banner Mining Co. acquired the Gould Mine with the intention of resuming mining operations. The Bureau of Land Management had agreed to reopen that acreage of land for mining. However, Tucsonans were vocal in their opposition to this decision that would have turned the surrounding area of the Gould Mine into an open pit mine. Because of public outcry against this action, Saguaro National Monument was expanded by Presidential Proclamation 3439 issued by President Kennedy on November 15, 1961. This action successfully defeated future claims at the Gould Mine by including it along with 5,360 acres of land as the western unit of Saguaro National Monument. Remnants of the Gould Mine continue to stand the test of time and the rigors of the desert environment. That includes an old powder house often mistaken for a miner’s residence. This rock structure served as a storage facility for dynamite. Additional structures nearby include the foundations of what used to be a blacksmith shop and a mess hall. Apparent at the site today are many rusted containers among the thick undergrowth of mesquite and cactus. Minerals found along the Sendero Esperanza Trail include azurite, epidote, garnet, malachite, and pyrite. These minerals originated from the tailings of the Gould Mine. Tucson historian William Ascarza will lead a tour of the Pinaleño Mountains on June 11. Cost of the tour, organized through Pima Community College, starts at $99, which includes transportation. To register call 206-6468. For more information, call 206-6579. • Clemensen, Berle A., 1987. Cattle, Copper and Cactus: The History of Saguaro National Monument. National Park Service Denver Service Center. Historic Resource Study Saguaro National Monument. • Elsing, Morris J. and Robert E.S. Heineman. Arizona Metal Production. Arizona Bureau of Mines, Economic Series No. 19, Bulletin No. 140. Tucson: University of Arizona Press, 1936. • Keith, Stanton B. 1974. Index of Mining Properties in Pima County Arizona. Tucson, Arizona: University of Arizona. The Arizona Bureau of Mines Bulletin 189.